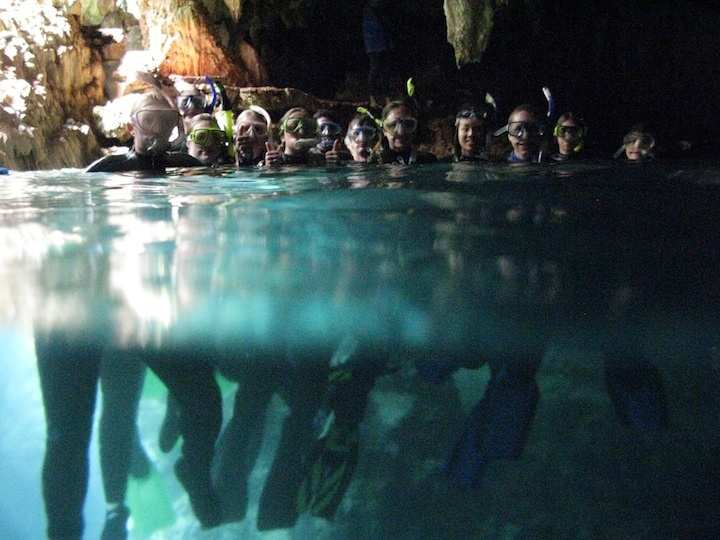 Courses I’ve taught in the past few years include Genetics and Genomics, Bioinformatics, Symbiotic Interactions at the Introductory and Advanced Levels, Environmental Science in the Field: Coral Reefs, and Engaging Biologists and their Research. My teaching goals include working with students to become integrative thinkers of biology. This includes integration from molecular to evolutionary scales, and integration between biological and computational knowledge. And, we take field trips! The photo on the left shows students from the Genomics course learning about bioinformatics and genomics research at Cold Spring Harbor Lab. Symbiosis — the relationship of two species that live in close, intimate contact for a prolonged period – plays a defining role in evolution, ecology, metabolism, and many other aspects of biology, and our goal is to use symbiosis as a vehicle for learning about biology. 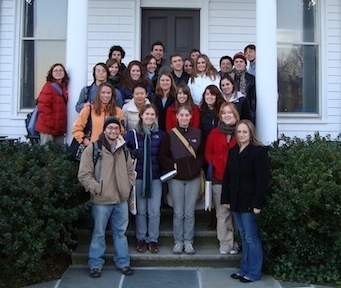 The goals of this course are to 1) provide a forum for you to work towards developing a broad understanding of some major concepts and processes in complex biological systems ranging from molecular systems to ecological systems, and 2) help you achieve an understanding of how biologists and other scientists approach the problem of learning how biological systems work. By focusing our attention on understanding symbiosis, we will not only help direct our discussion of biology, but will also make the concepts and processes more relevant. Investigation of biological questions via extended laboratory or field projects. Emphasis is placed on observation skills, development and testing of hypotheses, experimental design, data collection, statistical analysis, and scientific writing and presentation. Taught with Biology Department faculty and staff. From understanding the role of a single gene in a single organism to understanding how species evolve, the field of genomics provides a lens for studying biology at all scales. In this course we develop a foundational understanding of genetics concepts and processes, and then deploy this foundation to probe some of the hottest questions in genomics. How do genomes evolve? What makes us human? How can we combat emerging diseases? In the lab component, students learn molecular biology and bioinformatics techniques, design and engineer a synthetic bio-machine from standard genomic parts, and use genomic approaches to understand how organisms interact with the environment. Taught with Barbara Holloway, Biology Lab Technician. DNA is the blueprint of life. Although it’s composed of only four nucleotide “letters” (A, C. T, G), the order and arrangement of these letters in a genome gives rise to the diversity of life on earth. Thousands of genomes have been partially sequenced, representing billions of nucleotides. How can we search this vast expanse of sequence data to find patterns that provide answers to ecological, evolutionary, agricultural, and biomedical questions? Bioinformatics applies high-performance computing to discover patterns in large sequence datasets. In this class students from biology and computer science work together to formulate interesting biological questions and to design algorithms and computational experiments to answer them. 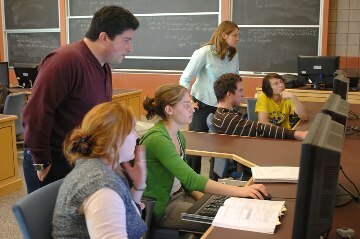 Taught with Marc Smith, Computer Science Department. A close examination of the active research programs of several biologists who will visit Vassar to present their research to the Biology Department. By reading and discussing the primary literature and interacting with biologists at different stages of their careers, students will develop a deep understanding of several current areas of biological research, and gain a better understanding of the scientific process. Students write a substantial paper focusing on one or more of the research areas discussed in class. From the evolution of eukaryotic cells to the creation of entire ecosystems, endosymbiosis is a driving force in biology. This course provides an integrative perspective on host-symbiont interactions in diverse endosymbioses. We spend the first half of the semester examining the critical roles of symbiosis in ecology, evolution, and human systems. Then, we examine the underlying cellular and molecular processes that lead to an integrated host-symbiont partnership, for example mechanisms of host-symbiont recognition, regulation of nutrient exchange, and genomic interactions.